Pola, who flourished in Rome at the turn of the fourteenth century, tells us three times, in three separate manuscripts, that she is the “daughter of R. Abraham the scribe.” Women as scribes is nothing shocking to us, fortunately, and neither is the idea of women copying religious texts like Pola did. We’re even familiar enough to have developed expectations: women scribes calls to mind nuns in monasteries. And the idea of a family workshop of commercial scribes is right on for the fifteenth century. But Pola’s oldest surviving manuscript dates from 1288. And she was Jewish. Medieval Jewish communities had no equivalent of convents, or of beguine or parish schools open to girls. Parents like Pola’s who wanted an educated daughter, according to Elisheva Baumgarten had to connect with a private tutor. This lack of formal education opportunities and institutional pathways for manuscript survival have led some scholars to minimize the potential importance of intellectual life for Jewish women. But the largely urban, business nature of medieval Jewish economic life meant basic literacy was a highly desirable skill. And the lack of monasteries and official civic positions made commercial scribes who could write the Hebrew alphabet a necessity, especially for religious texts. In the twelfth century, Maimonides (sort of the Jewish Thomas Aquinas) had ruled in favor of the Talmudic proscription against women (and heretics, snitches, children, heathens, and Samaritans) copying Torah scrolls—but medieval Jews from France to Yemen recognized that this ban need go no further (yes, there were Jewish women scribes in Yemen). Abraham and his wife, part of a family of scholars and scribes, did well to introduce their daughter to the family craft. Yes, we tend to think of manuscript copying as a craft or trade, and so did medieval people. But they also saw it as a creative art. In a medieval manuscript culture of excerpts, pseudonyms, loose translations, and general textual fluidity, ideas of “authorship” diverged sharply from the modern concept of a single governing figure. Scholars today recognize scribes’ share in authorship most importantly because medieval people did. But also, it just makes sense: the scribe’s decisions about what to copy and what not, what changes to make or not to change anything at all, and such things all indelibly shaped the final product. Some scribes also produced what we might call “original writing” in the form of colophons. A colophon is a sentence or passage added to a book with information about the publication setting or publisher—today, the printer; in the Middle Ages, the scribe. Three surviving manuscripts have colophons by “Pola, daughter of R. Abraham the scribe.” Although short and formulaic, they provide a fascinating look at this particular scribe and her world. The three texts are a commentary on the Prophets (1288), a compilation of halakhic rulings (interpretation of Jewish law) (1293), and a prayer book (1306). All three are in Hebrew. She wrote the prayer book for her son Solomon, which calls to mind the fifteenth-century Christian women like Dorothea von Hof who passed down their personal prayer books to their children. Buyers sought her ought to write the other two, though she does not name the patron of the Bible commentary. The colophons, while not direct copies of each other, include standard devices and types of phrasing. The quality of the writing and her ease at using scribal language shows that Pola was a trained, experienced, and working scribe. Pola was also highly educated. She commanded Hebrew to the extent that she wrote her colophons in it, not in a vernacular using Hebrew letters. 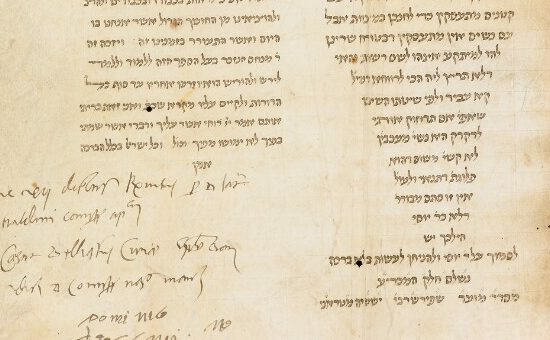 Furthermore, each colophon weaves in different quotations from the Torah for different purposes: to describe her act of copying, to justify her production of the text, to express her hopes for the text’s use. She knew holy scriptures well enough to pull out specific verses and apply them to the situation! Finally, Pola’s colophons give us a tantalizing view into her family life and role as a scribe. She traces her own genealogy back through generations of scholarly men. Additionally, in her 1288 colophon, she names her husband as R. Jehiel ben R. Solomon—but in 1306, she writes the prayer book for “my son Solomon, the son of my esteemed teacher, the pious R. Solomon of blessed memory, the son of Moses b. Jekuthiel.” Pola outlived at least one husband, possibly two. Furthermore, her reference to Solomon as her teacher might be a standard trope. But it could also suggest that the daughter of a scribe married a scribe—a social choice, yes, but also one of the best ways for a medieval woman with a professional trade to continue working in that trade through marriages and widowhoods. Only three of Pola’s manuscripts have so far been identified. There were probably more, but it’s impossible to know how many. The majority of commercial scribe work related to commerce, to economic and legal business. What does survive, however, shows that Pola was an educated, trained, experienced scribe who was proud of her work and committed to writing.